La Bagnaia Golf & Spa Resort Siena, Curio Collection by Hilton is composed of buildings that date back to the time of the Barbarians in Italy. This was a dark period in Italian history, marked by wars and pestilences. However, the first written evidence of La Bagnaia is in a document from 1081. It is a signed donation by the Emperor and King of Germany, Henry IV (Arrigo the Fourth). Other documents from this time period include papal bills by Pope Alexander III (1159-1181) and Pope Innocent III (1198-1216). The village that La Bagnaia calls home was settled around 900-400 B.C. The village prospered for many, many years before experiencing a blight. This led to the bishop of Siena merging the Parish of Bagnaia with nearby Filetta. The rebirth came several decades later, when the notable Jacopo Bichi bought the whole estate. The purchase included all houses, cultivated fields, springs, and woods. The wealthy Bichi family decided to build their country residence on the land, and restored the ancient homes and revived the infrastructure and utility services. The site that was once of the home of the Bichi family is now the La Bagnaia Resort. The more modern history of La Bagnaia, common with all the most evocative villages of the Terre di Siena (Siena’s County), remains linked to the traditions of the origins and the rural culture, which have characterized the settlement’s structure with spontaneous rural dwellings perched around the ancient church. In 1954, Attilio Monti, Knight of Labor, acquired the Tenuta (estate) La Bagnaia. There were over 2,700 acres of land surrounded by nature, just a few kilometers from Siena. 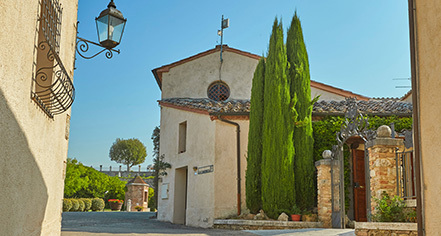 Over the years, Monti’s daughter, Marisa Riffeser Monti, turned it into one of the best examples of exceptional Tuscan style hospitality featuring tradition, nature, history, and tranquility. 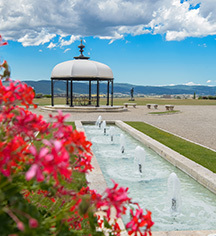 What stands on the land Attilio Monti purchased is now known as La Bagnaia Golf & Spa Resort Siena, Curio Collection by Hilton, the 25-acre resort including the medieval villages of Filetta and Bagnaia, the ancient baths of Santa Caterina (the Buddha Spa by Clarins), surrounded by the remains of ancient castles and forests.